Virginia Choice Service Details - Greenville, South Carolina | Watkins Garrett & Woods Mortuary Inc.
Mrs. Virginia Graham Choice, 75, of Piedmont, South Carolina, passed on Sunday, October 21, 2018, at Rainey Hospice in Anderson. She was a daughter of the late Ben and Corine Ransom Graham. She earned an associate degree in tailoring and sewing. 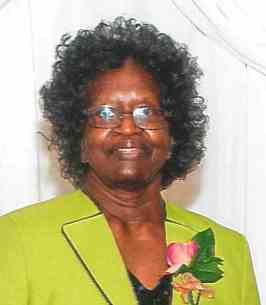 She was employed at Michelin Tire Company, and was a member of New St. Luke Methodist Church. She was preceded in death by her daughter, Adrianne Denise Choice and brother, Benjamin Graham. She leaves loving memories to her husband, Johnny F. Choice of the home; one stepdaughter, Carolyn A. Choice of Greenville; one stepson, Walter A. Choice of Mauldin; one sister, Helen Greer of Greenville; and a brother, Malachi (Faye) Graham of Lake City; two sisters-in-law, Mary Davis of Taylors and Linda Ellis of Greenville; one grandchild, Dequan A. Cannon; eight aunts, Flora (James) Porter of Columbia, SC, Carrie Ransom of Kingstree, SC, Florence Fulmore and Louise Fulmore, both of Lake City, SC, Bean Williams of Landover, MD, Margaret (John) Scruggs, and Sadie (Samuel) Cobb, both of Virginia and Eva Mae Fulmore of Florence, SC; four uncles, Edward (Mary) Ransom of Kingstree, SC, Willie (Rachel) Ransom of Washington, DC, Harold (Sharon) Ransom f New Jersey, and Jack (Retha) Fulmore of Fredericksburg, VA; and a host of other relatives and friends. I am sorry for your loss of your love one, Mrs. Virginia Choice. Expressing my sincere condolences to the family. May the God of all comfort sustain each one of you during time of grief. 2 Corinthians 1:3,4. To The Choice & Graham Family, Praying that the Lord give to the strength during this time in your life. Remember, God will never leave you He is always with us. Our hearts go out to Brother Choice and family. We will miss Virginia at church. So sorry to hear about her passing. She's with the Lord now and no more pain. Virginia was one of the best lady I will ever know. I worked with her for years and could not have found a greater woman and worker like herself! Both Johnny and Virginia are the kind of people hard to find these days. Sending prayers to the family in this time of need. God Bless. So sorry to hear about the loss of my niece she will be missed love and prayers to the Family, Harold Ransom Danville,Va.